Ferguson police agree to Department of Justice reforms. 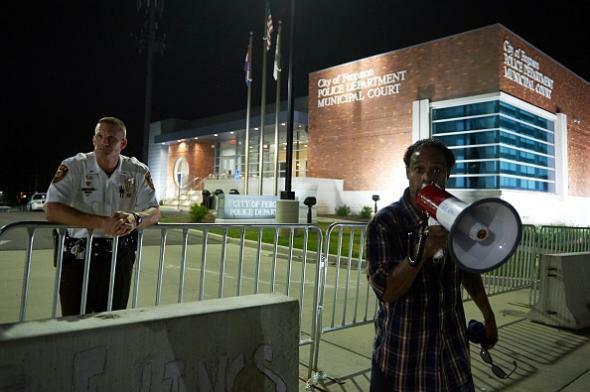 An officer and a protester outside the the Ferguson police department building on Aug. 7, 2014. The 127-page proposed agreement creates guidelines for training police officers on issues like when they should use force and how they can “reorient Ferguson’s use-of-force policies toward de-escalation and avoiding force.” The agreement also requires body-worn cameras and an overhaul of the municipal court system. Importantly, and like other agreements in the past, it requires the selection and appointment of an independent monitor. To become final, the agreement will need to be ratified by Ferguson’s city council and approved by a judge. The pursuit of civil-rights-related consent decree reforms has been a priority of the Obama Justice Department; the city of Cleveland agreed to a decree earlier this year, while similar plans may also be in the works in Baltimore and Chicago.